A Day Late and A Dollar Short: Lindt Chocolate - $10 for $20 Worth of Lindt Easter Chocolates, Truffles, and More! 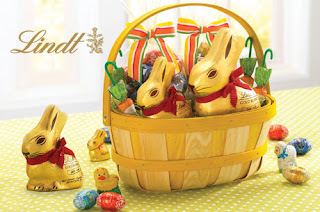 Lindt Chocolate - $10 for $20 Worth of Lindt Easter Chocolates, Truffles, and More! ...and here we go...I love this Eversave deal for today! They may have a penchant for Fun Dip and instant mac 'n' cheese, but years of hard jelly beans and cheap Peeps have turned our kiddos into harsh Easter candy critics. Fill their baskets with only the best this year, thanks to today's Save from Lindt Chocolates — the Master Swiss Chocolatiers you know and love. And if the Easter Bunny happens to take a few truffles for herself, we promise not to tell. 67 years of skill and dedication go into crafting Lindt's smooth, premium chocolates. So it's no wonder that we still can't get enough of their LINDOR truffles and assorted chocolate boxes.